Chillin’ at my BFF’s house after HR attending my first HRevolution, I picked up the latest Vanity Fair. See me and my BFF love to relax to Vanity Fair, US weekly and the Real Housewives of Atlanta. It was a good chillin’ moment after the conference at Georgia Tech. In between stories about Rob Lowe and the Royals, there was a small one pager about Harold Bloom. Bloom is the preeminent US scholar on all things Shakespeare; he should be–he’s 80, has written 39 books (mostly on the subject o’ thee Bard), and has been teaching on the subject at Yale for 55 years. Whuuu…. makes your head spin. Oh and he thinks Shakespeare is God. Duh. Then the article swung me to an HRevolution place. At that time HRevolution was in my headspace pulling a full-frontal on me. This is the very reason why HRevolution worked for me. After reading lots of material from a lot of the attendees at the HRevo, it’s been easy to infer who they are from their work: blogs, tweets, job titles, etc. But in the live, kinetic, authentic context of the conference/unconference you were able to see the value, voraciousness, and depth of the work through the person. For example—Charlie Judy through his blog HRFishbowl writes about Simply Engineered HR. Premise = quit over thinking HR and get back to the basic, human element of the profession. Reading his blog you can interpret Charlie through his work. Charlie is a smart HR guy so there is a lot to take away. However, in real life when you see how he interacts with people, very open, welcoming–dare I say Charming (not in a creepy way @DwayneLay) you begin to be to see “the (HR) work in the man”. When you see his talk about his children, family you begin to see “the (HR) work in the man”. The HR context is full circle. So that is the beauty of the HRevolution. And a beauty you should share on your own HR stage. And as Shakespeare said…all the world’s a stage. Dawn, great to see you. I like the back to basics message. I love the link to Shakespeare, too. He was such a strong writer because he knew the basics of language. He could freestyle and improvise because his strong skills set him free. Good model for HR pros. Wow! I’m clearly not worthy of being referred to in the same blog post as “the bard” even in the most infinitesimal manner. I am humbled and honored that you thought to reference me for this great post. You touched on the very essence of what makes these conferences so meaningful: getting color, character, and life around all these 2-dimensional souls we’ve been following and conversing with primarily in the social media-sphere. I love having that more intimate context as we advance these relationships – new and old. And I particularly enjoyed getting to know you. Thank you! Love the vibe of this place here, Dawn! So nice to meet you and get to chat a bit at the event – next year I am making you lead your own session! @laurie: Thank you for checking out the post! Good to see you too. 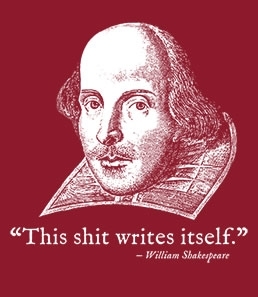 I couldn’t agree more; Shakespeare has it going on. Through language barriers (funny since it’s English) many don’t see the simplicity in the emotional throughlines in his work. @Charlie: Enjoyed getting to know you too! You were the perfect real life link to the Shakespeare message. @Steve: I like cool vibes… Looking so forward to more great convos and would love to lead a session. More to come sir and I’ll be happy to hop on/listen this Thurs…. @Shannon! So good to connect to you too! Glad we are of similar philosophies—can’t wait for more adventures. より:I loved as much as you will receive cairerd out right here. The sketch is attractive, your authored subject matter stylish. nonetheless, you command get bought an shakiness over that you wish be delivering the following. unwell unquestionably come more formerly again since exactly the same nearly very often inside case you shield this hike.